There is a window of opportunity if you can see it and work together. I am speaking to the prophets and revealing what is ahead. I am speaking to the apostles and calling them to partner with the prophets to secure a healthy foundation. I will show you what is to come and what the enemy has planned. This is not to incite fear or panic, but to give needed foresight to execute MY plans. Do not focus on what the enemy is doing, but on what I am revealing. I reveal things to empower your faith and coordinate your response. Though it appears the “past” has died and your national heritage with it, it hasn’t! Though the enemy thinks he can kill my promises, they are not dead! 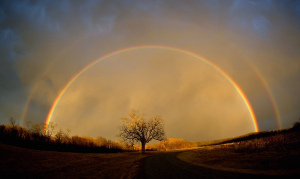 Though he has distorted and profaned even the symbol of my promise in the rainbow, it is I alone who can keep my promises. His promise is a counterfeit freedom and it will not last. He cannot hijack my promises! I alone can promise eternal life and lasting freedom. I alone am the One who will KEEP my promise to those who seek me with their whole heart. I am calling the prophets to be alert to revelation, insight, and foresight. I am calling the apostles to walk with the prophets to repair the breach (2 Peter 3:1-4). I have given the apostles the keys to this release, but as they defer to and work with the prophets on the timing and execution of my plans, my favor and blessing will go before you. My prophets may be given the revelations and insights, but it is my apostles who have been given the authority of My House (Matt. 16:18-19). Each must work with the other in order for my plans to succeed. My house is a house of order and a house of honor. In this hour, I will move through a company of believers, not just an individual. It is time to honor and esteem the portions I have given each and synchronize your efforts to establish the true authority of My house (Ephesians 2:19-22). Do not focus on all the roadblocks. I will remove them as you look, not to the seen, but to the unseen realm. Fix your eyes on what is unseen. Those who are against you may seem to outnumber you, but you must look to the heavens from where your help lies. I have a heavenly host specially assigned to assist you. As you honor them, you honor me. They are here to help you (Matthew 13:36-43). You must call up the old promises – the words I have already spoken. It is in the calling out and calling up of my eternal truths and declarations that will cause the shift. The blessings of the generations are still alive. The Body of Christ in this nation has simply forgotten who she is. She has lost her way. Help her find the way back by calling her out as I see her. Discover the ancient paths and call them out (Jeremiah 6:16). The power of My Word will be felt as you agree with the mandates of heaven established before time. I have said you will crush the serpents head (Genesis 3:15). This is not done by rebuke or constant warring in the spirit. His head is where the poisonous lies are and it is these lies that must be disempowered by my Truth. Speak my truth in the opposite spirit that the enemy speaks. Remind each other of what is true, right, and HOLY. It is not simply my Love that will conquer, for my love is easily distorted and manipulated for man’s use. No. It is only my Holiness that sets me apart from every other god, mindset and entity that tries to rule my kingdom. Declare the BEAUTY OF MY HOLINESS. The world has been blinded by a love that is self-centered and self-serving. Though my people will be known by their love for one another, I will be known through my holiness. Without holiness, no one can see me or truly know me or the Love that I alone give. Seek the Holy Place of my Presence and allow me to fill you with my holiness. It is my holiness that will ultimately defeat this enemy. Do not waste your time on endless arguments or controversies. This is a trap of the enemy to distract you from the task at hand to declare my kingdom to those who truly want to listen. The present crisis is not an issue of interpretation of the law. It is about issues of the heart. There is a separation happening. It is needed and it is of me. It will cause pain but it is necessary to separate those who are truly mine and those who are not. This is not a matter about salvation as much as a matter of which kingdom one will live in and serve. The days ahead will take courage. They will require you to work together. You must be prepared to obey instantly with a deeper understanding of my words and my ways. Watch, look and listen for my initiatives. Even now I am revealing strategies. Acknowledge and honor the apostles and prophets I have prepared for these days. Acknowledge and honor the five-fold gifts I have given to the Church to empower and equip for this time. Submit to one another and deepen your commitment to one another in covenant relationship. The enemy has no foothold when my covenant people walk and work together on the land! My promises still stand. My purposes remain. My plans will be revealed. Look, listen and then work with the unseen realm to see my kingdom manifest. You are not alone and you are not helpless. It is time to act. It is time to rise up and be the royal priesthood I have called you to be. I am coming to establish my kingdom with you, my sons and daughters, and that’s My Promise. Darlene, I don’t have any clear direction on Revelation 20, other than the sense we are probably heading into it. Too many unknowns, yet:-). Regardless, we must be ready. What do you understand of Revelation 20 and what are the few key scriptures to testify of it?